A Class representing an imperative World and the related methods for drawing the world and handling various events. In order to implement a functioning World you must extend this class, and implement an onDraw method. Other handler methods (tickRate, onTick, onMouse, onKey, onRelease, onOrientation, stopWhen, and lastScene) are optional, and can be overridden to add new functionality. See the individual methods for detailed documentation. Developing an Android application is a bit more work, since it requires the Android development kit for Eclipse. After that, you can create an Android Project and fill in all the parameters. The World/VoidWorld classes only require a simple hook to be added to the application's Activity. Below is a simple example of a World that adds a new point at each mouse click. The world contains a Scene and a new Circle is placed for each "button-down" event received. The VoidWorld is created in the class that extends Activity. Kick off the interaction/animation in PORTRATE mode. Kick off the interaction/animation in FULLSCREEN/PORTRATE mode. Kick off the interaction/animation in LANDSCAPE mode. Kick off the interaction/animation in FULLSCREEN/LANDSCAPE mode. Returns the Scene that should be displayed when the interaction/animation completes (stopWhen() returns true). Return a visualization of this World as a Scene. Change this World when a key event is triggered. Change this World when a touch event is triggered. Change this World when a device orientation event is triggered. Change this World when a key is released. Change this World based on the Tick of the clock. Determine if the World/interaction/animation should be stopped. Return the tick rate for this World in seconds. Menu Key event String. The menu key will usually be intercepted to open a save dialog to enable the capture of application/game screen-shots. Return the tick rate for this World in seconds. For example, 0.5 means two tick. The rate is only accessed when bigBang() is initially called and the window is created. Change this World based on the Tick of the clock. This method is called to get the update the World on each clock tick. Change this World when a touch event is triggered. x and y are the location of the event on the device screen, and event is a String that describes what kind of event occurred. In addition to the normal World events (button-down/up) Android devices include a "long-button-down" event, for when the the user does a long press (touch and hold). Change this World when a key event is triggered. 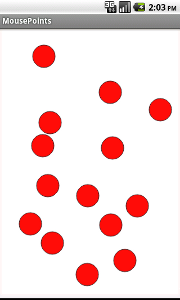 The given event is a String that describes which key was pressed. Other keys generate a single character String that represents the key pressed. For example, Pressing the B key on the keyboard generates "b" as an event. If the shift key is held while pressing B then "B" is generated. Change this World when a key is released. The given event is a String that describes which key was released. Other keys generate a single character String that represents the key released. For example, Pressing then releasing the B key on the keyboard generates "b" as an onKey event and again as an onRelease event. If the shift key is held while pressing/releasing B then "B" is generated. Change this World when a device orientation event is triggered. x, y, and z make-up the new orientation vector for the device. When the device is resting on a flat, level surface the orientation should be entirely in the z direction (typically straight out the the back of the device). Determine if the World/interaction/animation should be stopped. Returning a value of true discontinues all events (mouse, key, ticks) and causes lastScene() to be used to draw the final Scene. Kick off the interaction/animation in PORTRATE mode. This method returns the final state of the world after the user closes the World window. Kick off the interaction/animation in FULLSCREEN/PORTRATE mode. This method returns the final state of the world after the user closes the World window.